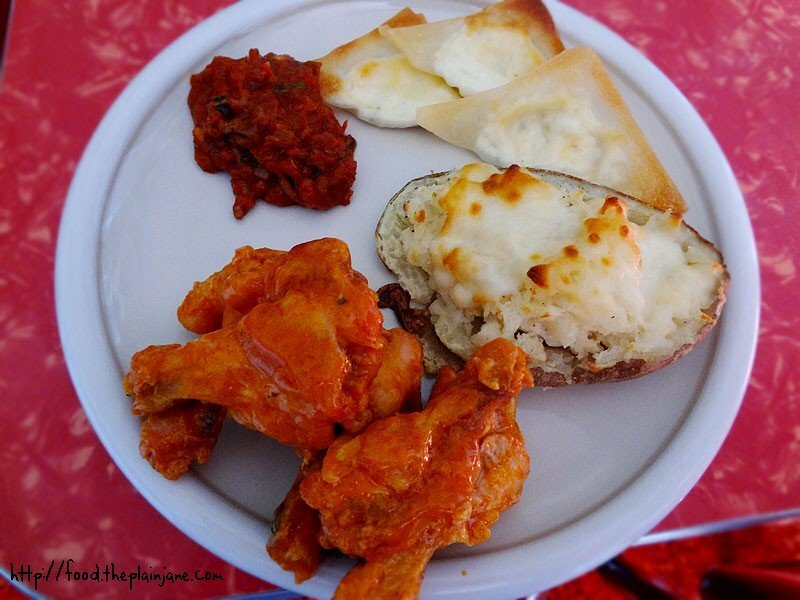 The buffalo wings I put up yesterday turned out good despite the oven mishaps. But on the flip side of that, I also made a recipe that was a total fail. It hurts a little to think about it. But I document it anyway because I’m some kind of glutton for punishment. And maybe I’ll have an idea later on how to make this work eventually! I had this brilliant idea: I wanted to a cross-hybrid of calzones with won-tons and I would call them WONZONIES. I love this name since it’s so close to Zamboni. Jake helped me come up with it. It was also semi-inspired by some pizza egg rolls we had at Fat Sal’s in Pacific Beach. My complaint about those were that there was too much sauce and not enough cheese. So I was going to try and do that, but with won tons and all cheese. And I was going to bake it! And boy, that sounded like a good idea. 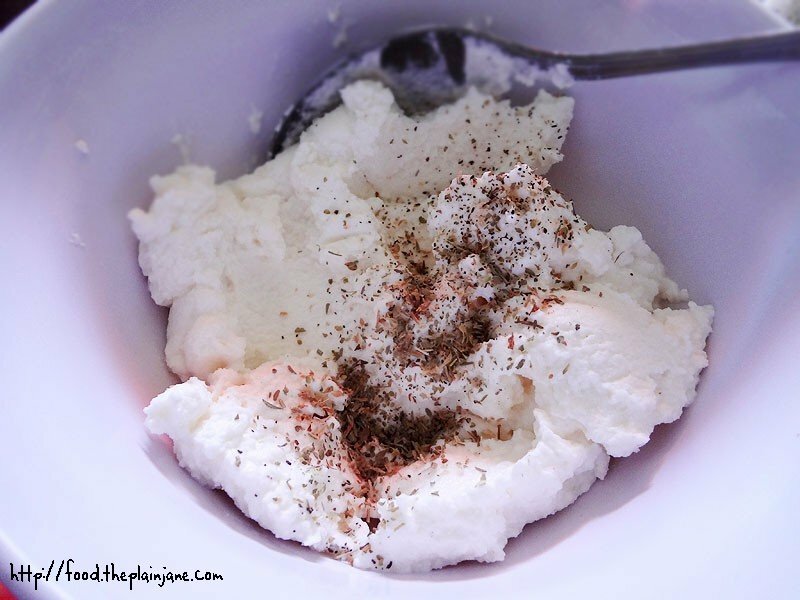 I added some Italian herb seasoning to some ricotta. And then I put the ricotta down with cubes of some fancy mozzarella cheese I got at Whole Foods. 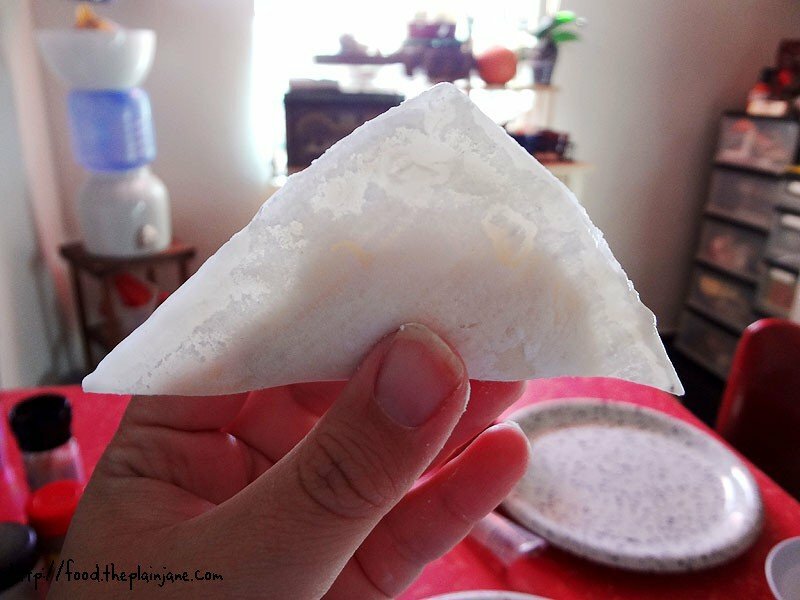 Seriously – if you can spring for it, get you some of this here mozzarella. Is it SO YUMMY. I’m kind of sad I wasted it in this recipe. 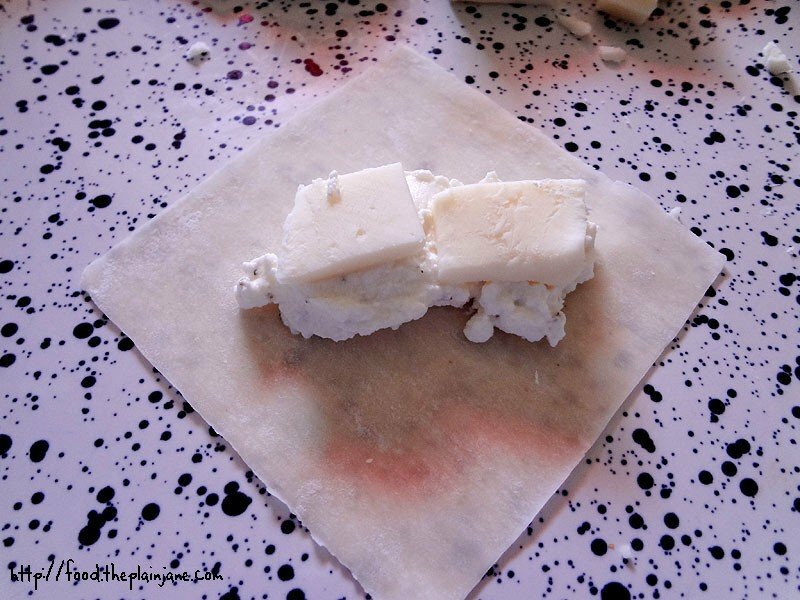 Use water to seal and pinch up the edges. Hoo boy. I didn’t get a ton of air out but I figured I was baking them. Who cares. Then I decided to brush them with olive oil for some reason. Due to the oven issues, they sad out for a long freakin’ time and the wrappers started looking a bit peckish and soggy. I should not have done the olive oil thing until later, or kept them in the fridge or something. And this is how it came out. Almost burnt on the edges with no color at all in the middle. Maybe if I flipped them it would have worked out but they were a bit fragile. This is how the side turned down on the pan looked – semi-crisp. Not at all what I imagined. Jake insisted that he liked them and that they were still good. He liked that they were “foldable” and made it easier to dip in the sauce. I just thought they were embarrassing and was glad I didn’t have to serve them to guests. Vaguely chewy, too soft, slightly burnt edges, semi-warm-ish cheese middle… just a fail, fail, fail. At least my “wonzonies” were sort of edible. I might revisit this in maybe egg roll form? Maybe the additional wrapper would help keep it sturdy and a short frying time would make it work out. Or maybe cheese is just too unstable for this application and that’s why they used so much sauce. I don’t know! All I know is at least I tried. And the homemade meat sauce I made was damn tasty, as where the huge twice baked potatoes. It wasn’t all a total loss… but certainly not a win! Better luck next time, Wonzonies. It sounds like such a great idea! I wonder if broiling them would help with some crispness, since you really just need to bake the wrappers and not so much the cheese filling. I have some wrappers in our fridge leftover from dumpling-making. 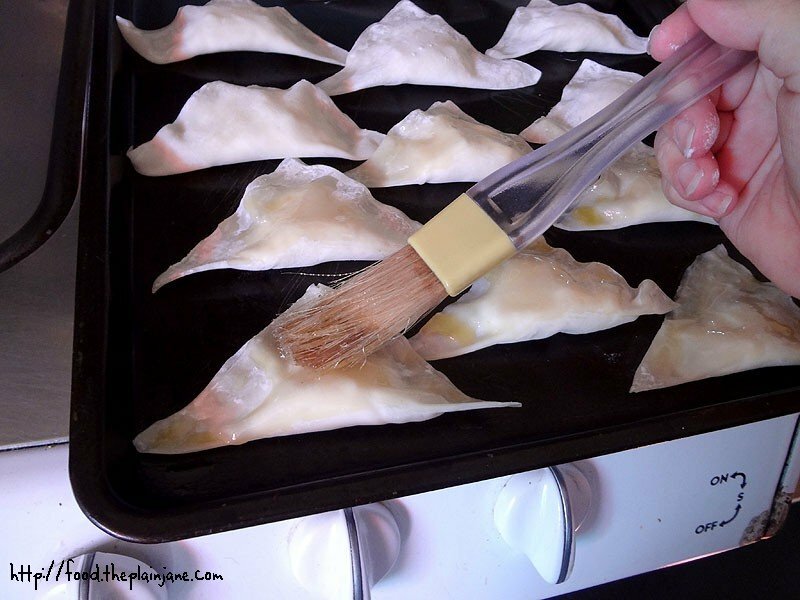 You’ve inspired me to see if there’s a good way to bake a wonton wrapper. Hi Leanne! Maybe they would have worked better with a sturdier dumpling wrapper, something thicker… or maybe the broiler would work. I never manage to get all of the air out whenever I do this kind of thing so the filling just spilled right out and puffed up when frying, but maybe egg roll wrappers would make it easier to fry. Or maybe I should try pie dough and fry that? So many ways to try it! I don’t know if the won ton wrappers will ever work out, haha. 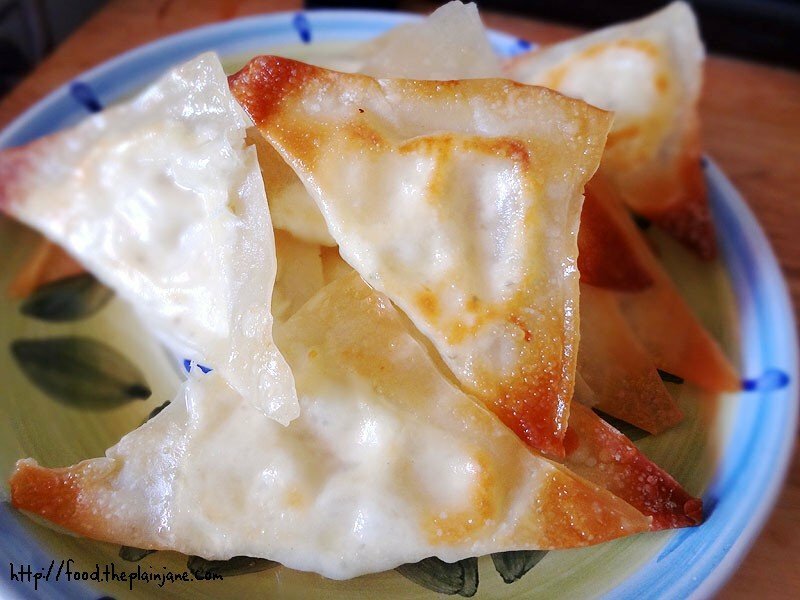 Let me know if you find any good ways to bake a wonton wrapper! At least you tried it out. We all can learn from our food “fails”. As for pie dough, Trader Joe’s all the way! Thanks, CC. TJ’s pie dough is the best! I don’t even try making it anymore. Too lazy. 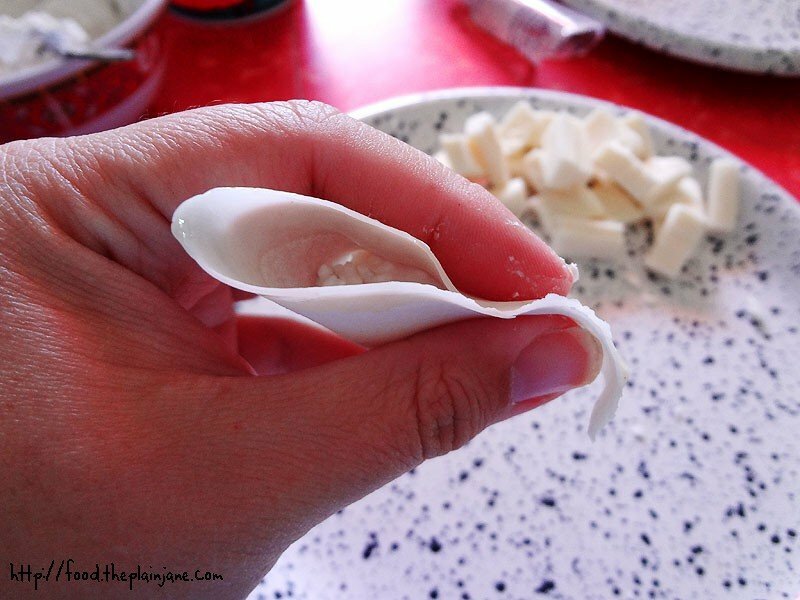 Otherwise , the Wonzonies name is so cute and the ingredients you stuffed in them looks delicious! Hi Faye – I overfilled them (because I was planning on baking) and I didn’t get enough air out so they just burst open while frying! Not good. Frying is better if you just have a small amount of filling but I wanted it to be like this oozy thing of cheesy goodness! Too bad. Have to go back to the drawing board. Can you maybe shred the mozzarella? 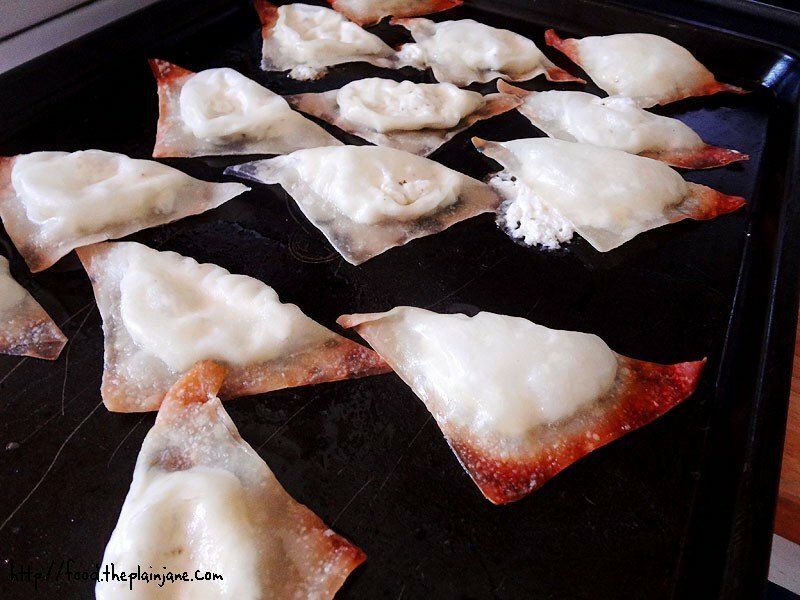 I have made baked crab rangoons before and didn’t have the problem with it browning. I did spray it slightly with non stick spray instead of brushing it with oil. Baked at 425 for somewhere between 10-15 minutes. I have done it with pork dumpling filling before also. I think that because the filling was all combined was maybe why it stayed together and held together. Hi Van – My problem might have also been because the oven wouldn’t get hot enough. Maybe less filling would have worked, too. Did you flip yours, or did they manage to brown on both sides? Maybe the oven’s higher temperature helps with the browning! I don’t remember if I flipped mine or not. 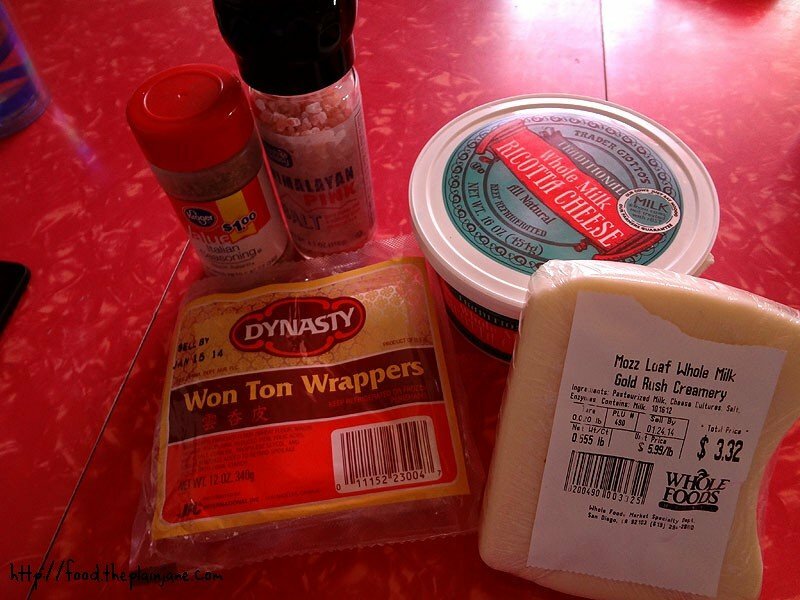 But I am trying out a different recipe later on using egg roll wrappers so I will let you know. This time my recipe was pretty horrible. But it could be the egg roll wrappers which I think while thinner is wrapped a bit more thicker then wonton wrappers. I need to try again with wonton wrappers but that probably won’t be till next weekend since this weekend will have too much going on to do so. Thanks for reporting back! 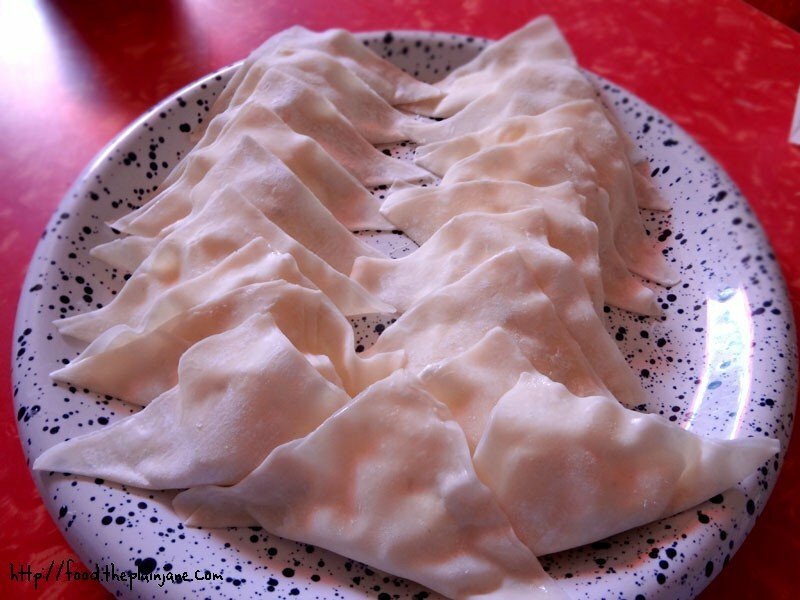 There are some thicker dumpling wrappers, too. Maybe those would work.